The Vision 2x4 Sunglasses are designed to be worn over spectacles and feature Polarflite polarised lenses for 100% protection from UVA, UVB and UVC light. The Polarflite lenses are activated with tri-acetate cellulose polarisation and will block both visible light and the light reflected from the water’s surface. 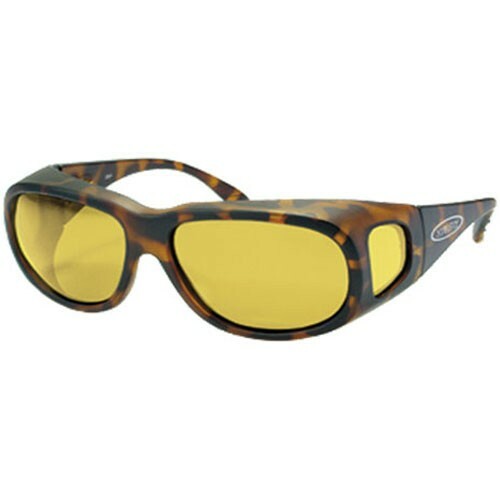 This will let you see beneath the water’s surface and greatly enhances your chances of spotting a fish. The frame of these sunglasses are light in weight and the rounded design allows them to be worn over your own reading glasses. Available in yellow or brown lenses, the yellow colour is good for enhancing light, good for dusk and low light situations as well as overcast days and evenings. The brown lenses are a superb all-round constant density lens. Optimised for medium to bright conditions, they provide the best combination of true colour transmission and contrast. The Vision 2x4 Sunglasses have a matte demi brown coloured frame and are supplied with a pouch and lanyard.